As of: Feb 21, 2016, we are "On The Air"
I had been planning on putting up an analog, funny how I have to differentiate analog vs digital now, my we've come a long way. Anyway, pardon my "squirrel" moment. I had been planning on putting an analog repeater up on this hill for quite a long time now, and have actually held the frequency pair for quite a while. 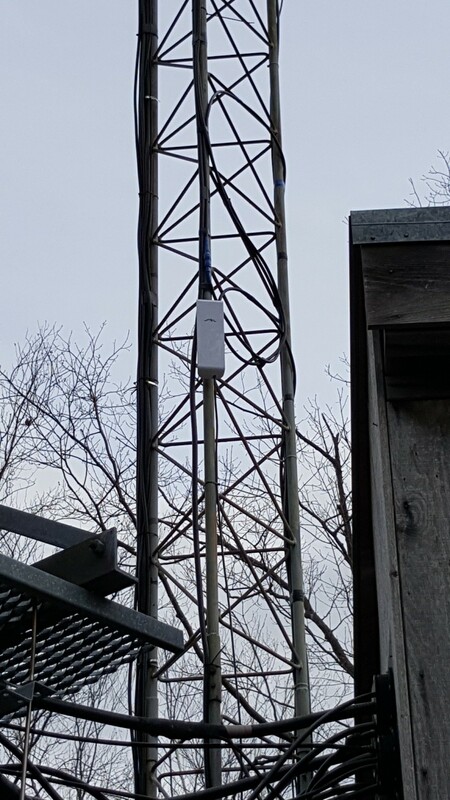 In fact, it almost made an appearance a few weeks ago, (end of Nov, 2015) but I ran into an overheating issue on the repeater itself at the last minute and didn't want to risk putting it up and having it catch itself on fire. So.... another delay. This original analog repeater project began a few years ago based on the interest of setting up a local repeater with access to Echolink. All the pieces came together and it was actually on the air for a while, minus the echolink part, but then it developed problems and for some reason became deaf. That eventually was resolved on the bench, but it never got back up on the hill. I had taken an interest in at least getting it going again, but nobody seemed too excited about doing the echolink anymore. At least not that I had heard of. In the mean time, I had set up a very local repeater in downtown Keene that could be used for that, but still, no real interest anymore it seems. 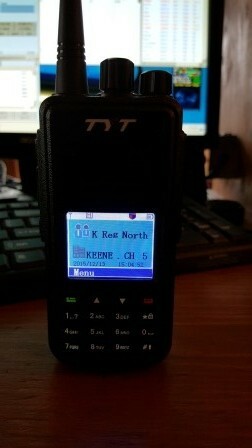 Sometime around September of 15, several members of the local Cheshire County DX radio club began talking about DMR repeaters, and the local club across the river in Vermont had all of a sudden come up on the air with 1 that was tied to two others in Vermont that were nearby, all of which were part of the DMR-MARC network. I could hear the Brattleboro, VT DMR just fine from home, so, off to purchase something to get me on the air on that system and learn what it was all about. 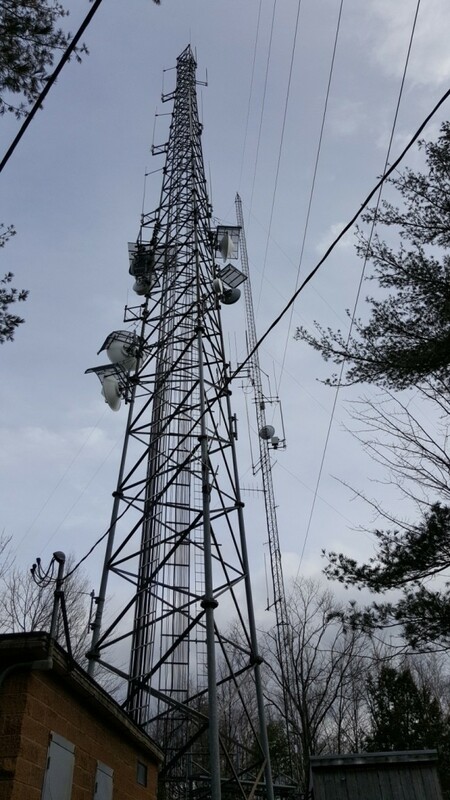 Around the end of October of 2015, I was approached by David, N1ESK, one of the members of the West River Radio Club in Brattleboro about the possibility of maybe putting up a DMR repeater at the site where my 443.8 UHF Keene Repeater lives, as they were very interested in filling in a hole that would cover Westminster and Bellows Falls, VT in addition to supplimenting coverage along I91 and maybe picking up the Keene area as well. About mid-December of 2015, I met with David to discuss this project and basically see what each other could do, to help each other out. 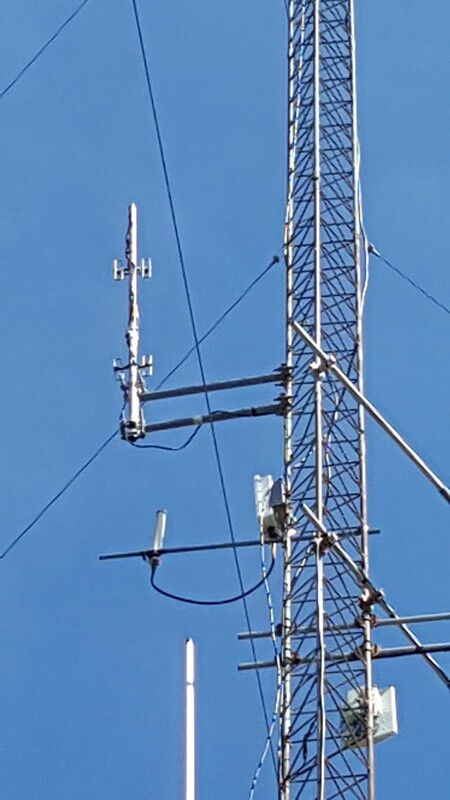 It was at this meeting that I suggested we try the Hyland Hill site, as I already had a coordinated frequency pair and the UHF antenna was already up plus I already, obviously, had duplexers ready to go on this pair. I certainly was willing to switch this one over from analog to digital, as this location would provide the desired coverage and there really wouldn't be that much of a benefit in having another analog repeater basically across the valley from 443.800. The only unknown really at this point of the discussion was whether or not I would have an internet connection. Those logistics are in progress at this time. So I've got the internet access worked out as of mid January 2016, and that will be provided by WiValley. They have part of their network already on the hill, so it's just a matter of getting a network drop over to the other building. Not too much of a challenge at all. It's not going to be "free" access, but very resonable for a T-1 data drop. February 2 and I now have all the equipment in my car to establish the internet connection. That will be accomplished by an Ubiquiti radio link to the WiValley system. On February 6, I received a text message from David asking if I was going to be around on Sunday to take possession of the DMR repeater. 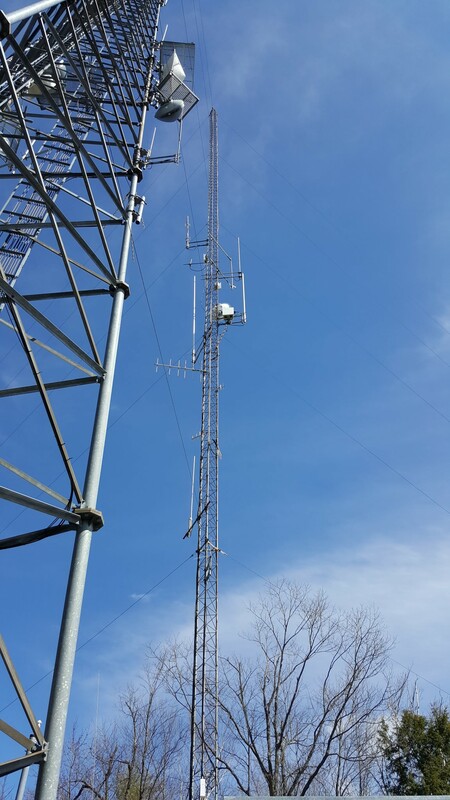 The West River Radio Club had made a HUGE equipment donation by supplying a MotoTrbo repeater for this project! So, I want to publically acknowledge the West River Radio Club for this and extend my personal Thank You!!! 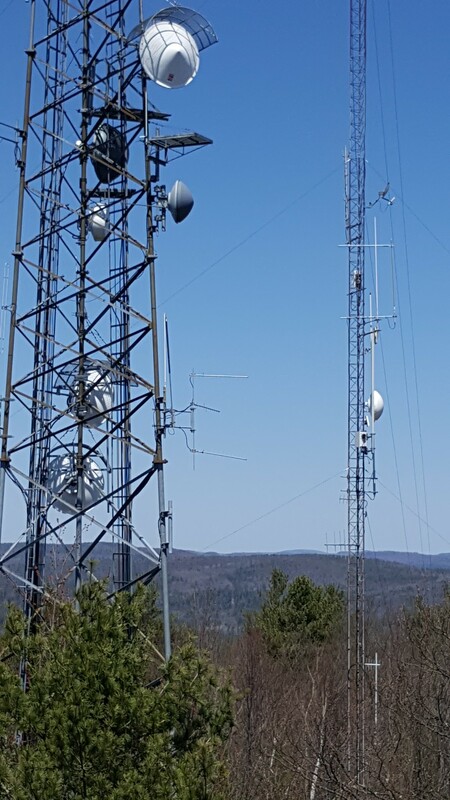 This is such a wonderful example of individuals and organizations combining resources to further our capabilities for the entire States of Vermont and New Hampshire, as well as the Amateur Radio community! Sunday, February 7, 2016 I took possession of that equipment from WRRC. Now all the pieces of this puzzle are assembled. The only thing left is to actually get up the mountain and install it. We're currently in the middle of a snow storm and I'm hoping that it'll drop enough to cover the sheet of ice that the access road to the site currently is. I've seen pictures taken as of last Wednesday, so right this very minute, there is no access. Well, that's not true, there is... but let's just say that "hiking" up there with this stuff strapped to my back IS NOT an option! Sunday, February 21, 2016, I get a phone call from Dale, N1NCI. Basically, we've had these phone calls before... "Hey, I've got the 6-wheeler, if you want to try to get up Hyland". So my typical reply is something to the effect of "you name a place and time, and I'll be there". 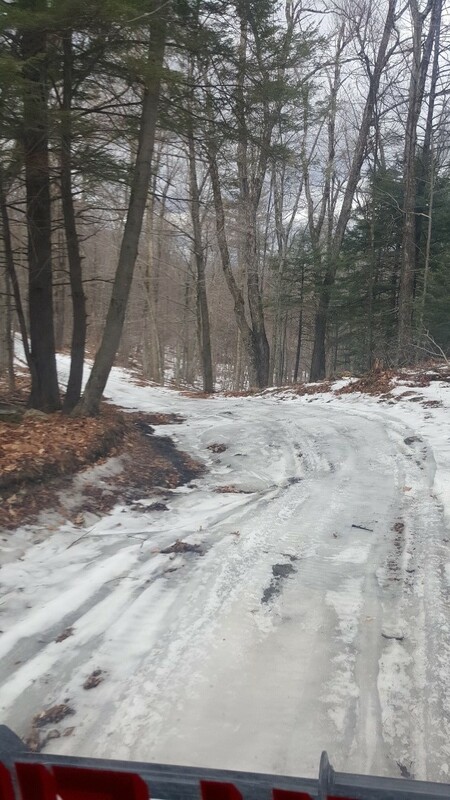 So an hour later and we were headed up the still very icy road. 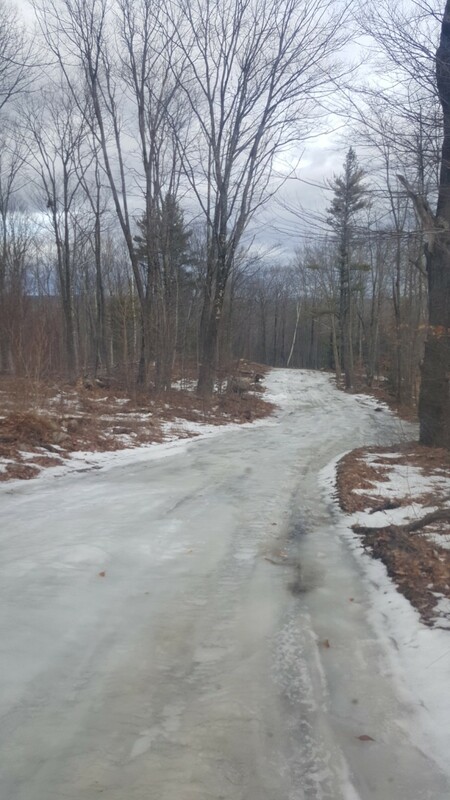 But the 6-wheeler, which happens to belong to SouthWest Fire Mutual Aid has all kinds of chains on some of those little bucky beaver road gripper tires, so we only slid a little. Also another Shout Out to Southwest Fire Mutual Aid for all of their help and support provided to the Amateur Radio community over the years!! THANK YOU! As we arrive, oddly, the summit is almost completely baren of snow and ice and the temperature was a very mild upper 40's to mid 50's. Not a bad day for mountain top work, considering it's 3 weeks into February. The first thing I notice as we're arriving at the towers is the new WiFi antenna on the tower leg. And we have a rock crushing signal with that, so it provides us with the equivilent of a T-1 internet connection. Plenty of speed for what we're doing. Scom 5K controller for the 6-Meter repeater. 6-Meter radio control head and UHF receive link radio, under those the GE Mastr II 6-Meter transmitter. Then the TX/RX UHF duplexers for the DMR repeater, then the power supply for the 6-Meter repeater. XPR8400 UHF DMR repeater, under that another XPR8400 VHF Analog repeater. Shelf for the VHF preselector and finally the VHF duplexers. Below are the towers where all this stuff broadcasts from. And finally after all of the initial testing, seems like everything is playing, it's now time to "slide" down the road. We really didn't slide much, only a couple times. Even you non-thrill seekers would have been fine on this ride!! Preliminary tests are showing that coverage still isn't as good as was hoped, but we are on the air. So, the next step will be to replace the antenna once Spring really does arrive. But I've already got that, so just a matter of getting back up there and go for a climb... Stay tuned!! Dale - N1NCI, Dave - N1ESK and I finally got back up the hill to make some changes. And we brought replacement everything! Well, everything except the repeater itself. 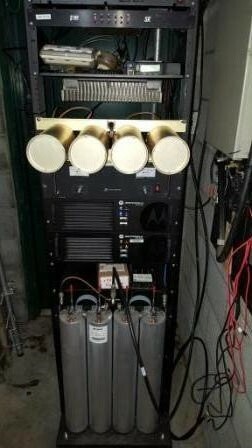 The first step was to re-program the repeater for high power. It was discovered after the fact, that when it was put in test mode on the bench, it wasn't taken out of test mode. No big deal, but obviously was going to have an effect on how well it was going to be heard. Next up, replace the duplexers, as we could tell that even local stations weren't really able to even bring up and hold the repeater, initial thoughts that I had were our good friend desense. So... we replaced the duplexers, still didn't make any difference, so... up the tower we go. Dale - N1NCI did the climbing and switching the antenna around. We took down the fiberglass whip and replaced it with a DB408 folded dipole array. While the feedline was undone from the antenna, we ran a sweep on the feedline to check it's integrity, and that checked out just fine. Once the new antenna was installed, WOW, what a difference! The repeater is now finally operating as it should. Coverage is great from what we can tell so far. Also, the climb today was much better than on the day we originally were planning to go a meer week before, when it snowed and we had fairly steady winds with 30mph gusts. This is close up of the new antenna. The new antenna, top-most antenna on the left of the small tower. The view that new antenna has. 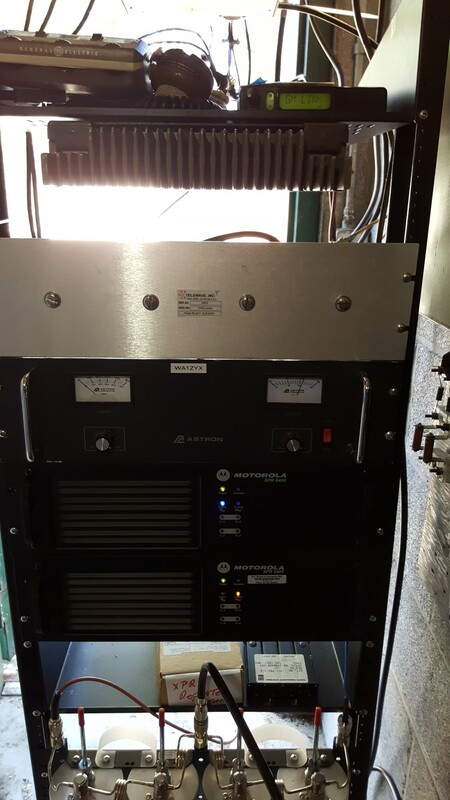 The current configuration of the repeater rack with the new duplexers installed. As of right now, these "Talk Groups" will replicate all the Vermont DMR repeaters along the I91 Corridor.